but as part of the solution to climate change. Why city matters? Once again this question. However, it continues to occupy the scene as, and this is nothing short of a truism: city becomes more important as more people live in it. And books, conferences, articles, websites dedicated to cities will increase, particularly as it has been forecasted here and there that some 70 per cent or so of the global population will live in cities by 2050. Well, an urban age, in a way. And a book, more like an UFO, difficult to categorize… while labelled as a guidebook (because of its title? Or the way the book has been structured? ), it is too unclassifiable to be considered as such. This book, City: A Guidebook for the Urban Age, written by Peter D Smith, published this spring. 400 pages… A pavé (voluntarily in French in the text, meaning a massive tome). People are moving to cities in unprecedented numbers, particularly in the developing world. Half of China's population is expected to leave the countryside for the cities by mid-century. By then 70 per cent of its population will be urban and about half of the population will be urban, and about half of the populations of Africa and India will be city dwellers. But as the number of people living in cities increases so, too, do the problems they face. The climate of the earth is changing and as a result cities are bracing themselves to cope with threats from a more hostile environment, including flooding and extreme storms, as well as rising temperatures and water shortages. They must also deal with profound social problems. For thousands of years, cities have proved highly effective at lifting people out of poverty. Not new. But these two citations do not mean that P.D. Smith's book City: Guidebook for the Urban Age is a book dedicated to specialists, let's say: planners, architects, historians, economists, urban sociologists. Nor is it an architectural history of city. Instead this book is much more a guidebook for specialists and non specialists alike. In short for those who share a strong interest in cities, say why cities matter. So these two citations do not reveal something new about what makes cities so attractive. No! As it is not the aim either. Again, the book can be read as a traveller's guidebook as well as a book for historians of city; a planner, an architect will certainly enjoy the content; An economist will even find a pleasure. In a way, a précis about cities, their mechanisms, their evolution…. A massive précis — 400 pages, I repeat. I however confess not to have read this book as a guidebook. I rather explored cities through P.D. Smith's lens. Smith lives outside of London, a megalopolis which recently was put in the light, worldwide, this August for Para/Olympics Games 2012. So I was not disappointed. The book is worthwhile reading, in particular for its content as well as its structure. My version is the Kindle edition (I am both a digital and print format lover). I consequently did not experience the pleasure of the print version which is certainly (or not depending on whether you are more ebook than 'print' book and vice versa) as enjoyable as its digital version. In a future world with ever more people and fewer resources, it no longer seems fanciful to imagine the creation of 'megastructures' (a world coined by Rayner Banham in the 1970s), in which a whole city is contained within a single building. The Situationist architect Constant Nieuwenhuys proposed a utopian megastructure called New Babylon as early as 1956. If, as scientists predict, the glaciers melt and sea levels rise dramatically, then ship-cities such as Armada in China Miéville's The Scar, or cities built out across water, as in architect Kenzo Tange's elegant 'Plan for Tokyo' (1960) which extended the Japanese capital out into the bay, might become reality. Transparent domes protecting cities are another idea popular with science fiction authors. In 1968, American futurist Buckminster Fuller actually proposed covering part of New York City in a vast air-conditioned geodesic dome. And who knows — in an age of climate change, such a scheme might indeed be necessary to protect downtowns from violent storms or stifling heat. In each chapter, Smith explores the mechanisms, history, driving forces that constitute city throughout its components, traces (graffiti), but also customs, habits, languages of its inhabitants (which at some moments reminded me Michel De Certeau's analysis in The Practice of Everyday life, in particular the second volume — but that concerns the French version only which is articulated into two volumes), urban life, street art, and events. that, for all their splendour, human achievements are only temporary: even the greatest civilisations will one day fall. [I]n any city street you might come across a ruined house, its windows blinded with boards, or a church where congregations once prayed being, pummelled by the wrecker's ball: these urban memento mori are all reminders that, despite their flawless plate-glass walls and the seemingly eternal roar of the traffic, even the greatest cities can become ruins. 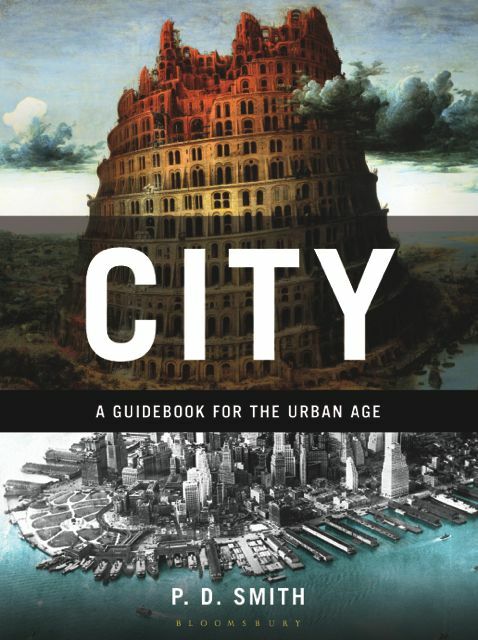 Peter D Smith | City: A Guidebook for the Urban Age | Bloomsbury Press, 2012, 400 pages. The book is available in hardcover format, $26,40, Kindle Edition $21,69, and on iTunes (As my iTunes is the French version, the price is in euros: 28.99€. Check out your iTunes version for the appropriate price). On the morning of 24 August ad 79, the Roman administrator and poet Pliny the Younger noticed a column of smoke rising 'like an umbrella pipe' above the volcano of Vesuvius on the other side of the Bay of Naples. The cloud climbed some thirty kilometres into the sky, eventually turning day into night. People were terrified, believing it was the end of the world. For those unfortunate enough to be living in the Roman towns of Herculaneum and Pompeii it was indeed the end. The following day, an avalanche of hot ash, rock fragments and super-heated volcanic gases engulfed both towns and their inhabitants, burying them under more than thirty feet of mineral deposits. There they remained until a surveyor rediscovered Pompeii in 1748. It was a perfectly preserved time capsule — Roman streets and houses, many with wall paintings still intact, bakeries, shops, bath houses and brothels (complete with obscene graffiti). To walk through the city was like stepping back two thousand years. Sure that Enthusiasts of history of cities will delight it (in particular throughout Smith's style). Pripyat, in Ukraine, was once a modern Soviet city of about fifty thousand people. But after the Chernobyl nuclear disaster in 1986, it was evacuated and abandoned. Within a decade, the concrete paving stones in the city squares had been broken and lifted up almost a metre by tree roots, 'as if a giant earthquake had struck'. Today, wild animals such as deer and boar move freely around the overgrown city, which has become a modern ghost town. In Beneath the Planet of the Apes (1970), astronaut John Brent (James Franciscus) discovers the ruins of New York preserve underground — the façade of the Stock Exchange, the Public Library, Radio City and St Patrick's Cathedral. He also finds a cult worshipping a deadly piece of twentieth-century technology — a cobalt doomsday bomb. It is a reminder that if there were a third world war, future archaeologists might find very little indeed of our cities, just ashes and carbonised remains. For the technologies of mass destruction perfected during the twentieth century mean that whole cities could be annihilated — literally wiped off the map — at the touch of a button. And there is plenty of examples like these ones. Writing a little while back on this review, I fear I may have sounded more enthusiastic or, worse, glib than I meant to. But this translates the pleasure I had this summer — I confess to have read the book four times always with the same pleasure — in reading this City: A Guidebook for the Urban Age. With evidence, PD Smith's City has several functions on this manner. I decided to focus on what I particularly appreciate in cities: urban exploration (among others. Note that my second read was under the scope of urban exploration. The third was dominated by sustainable cities…). I will read it once again but through the architect's lens — with a focus on The Skyscraper, Norman Foster's Masdar City — and that of the planner — with a focus on Wired City (another pleasure), Eco-Cities, The Park, Traffic, Slum City. So the book won't quit my bedside table soon.